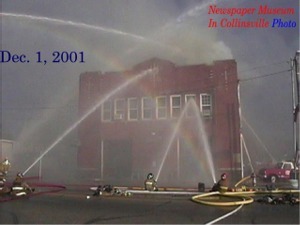 Collinsville lost their jail, police station, fire station and city offices when City Hall burned Dec. 1, 2001. 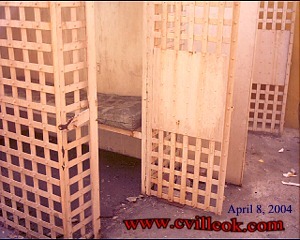 The jail was the last of those facilities to be restored during the 9+ year span that followed. The only "bars" visible in the new city jail are in the ceiling under two skylights providing natural light in the day room just outside the cells. The new cell doors are solid doors with special windows. Collinsville's new Police Chief Jimmie Richey is interviewed by TV Channel 6 with several media including the Tulsa World on hand for the open house / ribbon cutting Friday. 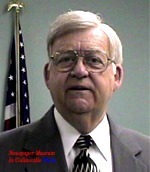 Mayor Stan Sallee used the ceremonial scissors (above) as city official marked the opening of the new jail facility at an open house Jan. 14, 2011. Mayor Sallee and citizens / dignitaries at the open house Friday posed with the new hot pink jumpsuit that Collinsville jail prisoners will soon be wearing. City Commissioner Pam Porter (left) is the only current commissioner in office while the former jail was in still use. These Collinsville police officers were available for a photo with their new jail Friday. They are pleased to no longer have to travel to Owasso (or Tulsa County) to house their prisioners. The local police dispatchers are also being trained as jailers to assist the officers. New covered port for real police station / jail entry. This hall way (beyond the "drunk tank" at the rear entry) leads past the new cells to the existing police station which had it's open house in ??. 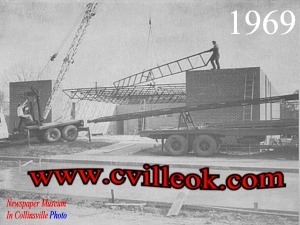 More Historical Information & Links Below advertisement (below). 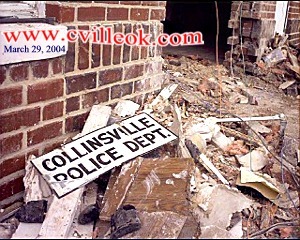 Remains of original jail in burnt out City Hall.